Much is known about the increasing levels of energy consumption and environmental decay caused by the built environment. Also, more and more attention is shown to the energy consumption of dwellings, from the early design stage until the occupants start living in them. The increasing complexity of building technologies, the occupants’ preferences, and their needs and demands make it difficult to achieve the aimed energy consumption levels. The goal of reducing the energy consumption of dwellings and understanding the share of occupant behavior in it form the context of this research. Several studies have demonstrated the ‘energy performance gap’ between the calculated and the actual energy consumption levels of buildings, and have explored the reasons for it. The energy performance gap is either caused by calculation drawbacks, uncertainties of modeling weather conditions, construction defects regarding air tightness and insulation levels, or by occupant behavior. This research focuses on the last aspect, i.e. analyzing the relationship between occupant behavior and energy consumption in dwellings, understanding the determinants of energy consumption, and finding occupants’ behavioral patterns. There are several dimensions of occupant behavior and energy consumption of dwellings: dwelling characteristics including the energy and indoor comfort management systems, building envelope, lighting and appliances; occupant characteristics including the social, educational and economical; and actual behavior, including the control of heating, ventilation and lighting of spaces, and appliance use, hot water use, washing, bathing, and cleaning. Attempting to understand this complexity asks for a methodology that covers both quantitative and qualitative methods; and both cross-sectional and longitudinal data collection, working interdisciplinary among the domains of design for sustainability, environmental psychology, and building and design informatics. The main question that this thesis deals with is: How much does the occupant behavior influence the energy consumption of dwellings in the Netherlands, and how could we identify the determinants of consumption, as well as the behavioral patterns and profiles? What are the existing models developed for the occupant behavior and energy performance relationship? and how different are the results of these models in terms of calculating the influence of occupant behavior on energy performance? 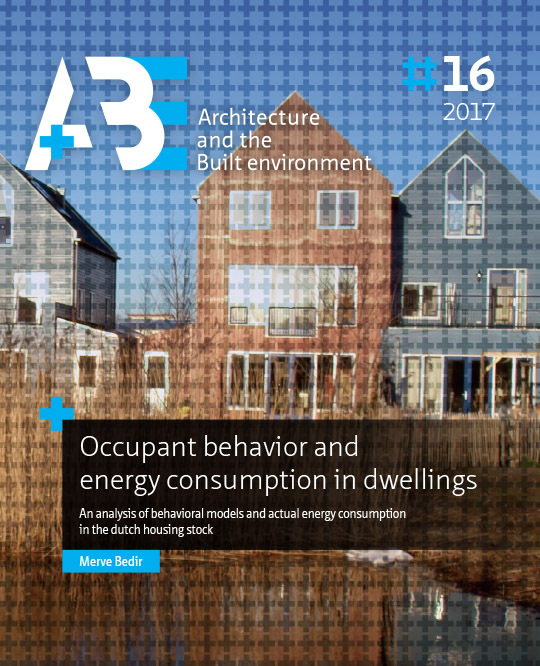 How can behavior be modelled in order to assess the robustness of the energy performance in dwellings to occupant behavior? What is the weight of each behavioral aspect in terms of its influence on energy consumption? How much of the variance in electricity consumption in dwellings can be explained by direct and indirect determinants? III What are the behavioral patterns and profiles of energy consumption? In this thesis, occupant behavior is modeled in different chapters using sensitivity, correlation, regression, repeated measures, and cluster and factor analyses, based on data on dwelling and household characteristics, actual behavior, and energy use. The structure of the thesis is based on the kind of energy use: heating energy and electricity for appliance and lighting. First, a sensitivity analysis for occupant behavior and heating energy consumption is conducted. Afterwards, determinants of occupant behavior in relation to heating energy consumption is explored through existing research. Determinants of electricity consumption for lighting and appliances are analyzed using correlation and multiple regression methods. In-depth analyses of behavioral patterns regarding heating energy are realized by repeated measures and cluster analyses, and electricity consumption by factor analysis. The research combined deductive and inductive methodologies. In this thesis, the deductive method is defined to operate on the macro level, using cross-sectional data on the dwelling and its systems, and include population data collected with one-time questionnaires and energy consumption characteristics based on yearly bills. The inductive method operates bottom up, applying monitoring and other longitudinal data collection methods and use actual data on thermostat control behavior. Research using inductive and deductive methods display a significant variance in explaining the sensitivity of energy consumption to occupant behavior. Three datasets were used in this research. The first one is based on data collected in Wateringse Veld in The Hague, and Leidsche Rijn in Utrecht. The data was collected through a questionnaire in the autumn of 2008. The inhabitants were asked to respond to questions regarding the architectural typology, the heating and ventilation systems, the envelope properties of their dwellings, the number and use of lighting and electrical household appliances, and the energy consumption, in addition to the economical, educational and social characteristics of the household and the individual, the presence patterns in the house and in different rooms, the indoor comfort and energy management behavior patterns, habits, hobbies, and health conditions. This dataset consists of 323 dwellings. The second dataset is comprised of 61 dwellings chosen randomly among the clients of one energy company. The household characteristics are representative for the Dutch average. Data on thermostat control behavior was collected by monitoring during March and April 2011, while a questionnaire was used for an inventory of household characteristics and behavioral attitudes, before the monitoring started. Lastly, the WoON survey was used as a validation database for the first dataset. The WoON Database of the Dutch Ministry of Housing includes data of 4500 dwellings and is assumed to be representative for the Netherlands. This database includes a household survey, data on occupant behavior, dwelling inspections and reports on energy consumption in 4500 dwellings across the Netherlands. Q I: Sensitivity analysis can be used as a method of evaluating the impact of occupant behavior on heating energy consumption. Heating energy consumption of a dwelling is the most sensitive to thermostat control, followed respectively by ventilation control and presence. Both heating energy consumption and the resultant indoor temperature are the most robust to radiator settings, meaning that heating energy consumption and resultant indoor temperature change minimal if the occupants change the radiator control. Q II: Total appliance use (ownership and duration of use of appliances) is calculated based on the direct detereminants of electricity consumption. DHES (Dwelling, Household, Economic, System) characteristics of dwellings, i.e. household size, dwelling type, the number of showers, use of dryer and washing cycles are the indirect determinants, and the combined model of direct and indirect determinants explains 58% of the variance in electricity consumption. Q III - 1: Four occupant profiles are identified for heating energy consumption: (1) no pattern, (2) one-off, (3) comforty, (4) controller. The first profile does not have significant common household characteristics, and displays no pattern of thermostat use. This profile requires detailed investigation of the household behaviors. The second profile, ‘one-off’ households pick a single set point over a period of hours (morning, day time, evening, and night time), and this is repetitive during two months. These households can be characterized with higher educated males and gadget lovers, not necessarily interested in energy saving. The third profile, ‘comforty’ households have a thermostat control of more than one set point and intervals, with high temperature preferences, in different days of the week, which is identified as a pattern during the two months. This group is composed of homeowners with a high income and larger dwellings, and are not interested in energy saving, also prefer higher temperatures. Lastly, the fourth profile, ‘controller’ households prefer one or two set point temperatures and intervals, with low temperature preferences, in different days of the week, repetitive for two months. Group four is composed of households with an energy saving agenda, mostly families and sometimes the elderly, where the parents/couples take decisions regarding energy consumption together. Q III - 2: Behavioral factors of electricity consumption are total appliance use, the use of Information, Communication, Entertainment (ICE) devices, presence, personal hygiene and household cleaning, and energy conservation behavior. Based on these, the behavioral patterns are defined as appliance use, the use of technology / occupant presence, personal hygiene and household cleaning / occupant presence, and energy conservation. The correlations between behavioral factors, and household and dwelling characteristics reveal the behavioral profiles. These are the specific groups of users with corresponding behavioral characteristics: (1) family (couples (sometimes with a kid) with average user behavior), (2) techie (households that possess a lot of ICE devices), (3) comforty (larger households with a higher income that have a high usage of lighting and appliances, as well as heating), (4) conscious (smaller size family, elderly, lower income, higher education households who consume less, as well as owning solar panels, energy saving lamps, etc.). The behavioral patterns and the behavioral profiles are statistically significantly different from each other in relation to electricity consumption. This thesis has been interested in determining occupant behavior in relation to energy consumption, claiming that the buildings’ energy consumption can be validated in total, only during occupancy, when the design is tested on actual use. Referring to the lack of research, this study combined the deductive (cross-sectional, macro data, macro level statistics) and the inductive methods (longitudinal data, detailed high frequency data, performance simulation), by considering both the determinants of behavior and the actual behavior itself. We found that deductive methods are much faster in calculating and dissecting energy consumption into its factors, such as household characteristics, dwelling characteristics, behavioral aspects, etc; and inductive methods model actual behavior from bottom up experimenting and validating energy consumption levels. In addition, this research has found that the heating energy consumption of a dwelling is the most sensitive to thermostat control, followed respectively by ventilation control and presence. Both heating energy consumption and indoor resultant temperature are the most robust to radiator control. Calculating a regression model on the determinants of electricity consumption, this research has found that using the total duration of appliance use and parameters of household size, dwelling type, number of showers, use of dryer and washing cycles, and presence in rooms, 58% of the variance in electricity consumption could be explained. Introducing behavioral profiles and patterns contribute to the modeling of energy consumption and occupant behavior, this research revealed that household composition, age, income, ownership of dwelling, and education are the most important elements of behavioral profiling. This thesis addresses occupant behavior in dwellings in the field of sustainability and building energy consumption by using interdisciplinary methodologies, i.e. by combining different modeling and data collection methods. It reveals unknown aspects of the relationship between energy consumption and occupant behavior, and reveals occupants’ behavioral patterns and profiles of energy consumption. For the energy and indoor comfort engineering industry, the knowledge gained through this research means support for designing systems that are more effective in reducing energy consumption, in addition to influencing users towards energy efficient behaviors. For policy, building industry, and design informatics (particularly simulation based energy performance assessment and design tools), this research illustrates the benefit of considering occupant behavior in early phases of design in renovating existing housing stock and for new housing when aiming for sustainability. Furthermore, this thesis could contribute to the better design and implementation of energy control systems and products. Further research could utilize this knowledge to increase the energy efficiency of dwellings. There is an increasing need for ensuring high energy savings throughout the building lifecycle, from the early design phases until post occupancy. Utility (services) and firmness (robustness) are principles of good design since Vitruvius, but sustainability was added as a new principle after 1980s, for a distinct understanding, evaluation and action development on energy consumption and environmental impact of buildings. Today, we are able to measure the consumption levels and environmental impact of our buildings, manage their indoor comfort, and combine this further with our personal desires. Sustainability means decreasing waste and pollution, the demand for physical resources (energy, material…) and the impact on climate change, while maintaining the indoor comfort and health conditions in a building. Design decisions for sustainability include that of land use, microclimate management, form, spatial organization, building envelope, and managing water, waste, and energy systems. The essence of sustainability lies in designing all these factors with a holistic approach, while making sure that the building is usable for the occupant. Energy efficient housing requires less energy and uses renewable energy resources in the most efficient way for the energy needed during occupancy. Kim and Rigdon (1998) define the three basic principles of sustainable design as efficient use of resources (reduce, reuse, recycle); assessment of resource consumption during construction and use; and human centered design (the interaction between the human being and the environment). This research addresses the latter, the human aspect. The buildings’ energy consumption estimated by simulation software can be validated in total, only during occupancy, when the design is tested on actual use. For residential buildings, we know that sometimes the actual energy use levels are different than the expected/calculated (Lutzenheiser, 1992; Jeeninga et al., 2001; Guerra Santin, 2010; Majcen, 2013). A couple of reasons to this can be calculation drawbacks, incorrect construction applications and unexpected occupant behavior. Therefore, better understanding of the relationship between occupant behavior and energy consumption can enable more efficient design and operation of (residential) buildings, which are more suitable to the occupants’ use considering thermal, acoustical, visual, environmental comfort, health and safety. Policy on energy efficiency in buildings focuses mostly on building characteristics and mechanical systems like heating and ventilation. Although there is strong evidence for the influence of occupant behavior on energy consumption, the effort made to gain more insight to this relationship stayed behind for a long time. This study addresses the influence of occupant behavior on energy consumption for heating and electricity use for appliances and lighting, in residential buildings. This research is conducted as a joint effort at Delft University of Technology, Faculty of Architecture, between the chair of Design Informatics; research program Computation and Performance, and the chair of Housing Quality and Process Innovation (HQPI). Chair Design Informatics, research program Computation and Performance aims to improve the performance of buildings by using computational methods for model generation and analysis, decision-making and design communication, in an interdisciplinary context. This research could contribute to the further development of computational model(s) and tools in support of user’s decision-making processes. Furthermore, one of the research goals of chair HQIP is to understand the influence of occupant behavior to energy consumption in dwellings. The PhD research of Guerra Santin (2010) and Majcen (2016) of the chair HQIP specifically focus on occupant behavior and energy consumption. This research is built partially on the same datasets as Guerra Santin (‘OTB dataset’ and ‘WoON survey’), with different research questions. Findings of Guerra Santin and Majcen’s research are referred to, in the relevant sections of this thesis. Most of the research conducted under the title of this PhD was published between 2009 and 2013. Chapter 2 provides an overview of a literature study of the existing knowledge on energy consumption from the urban to the user scale, energy performance modelling methods, the energy performance gap, and insights to determinants of heating energy and electricity consumption. This review first helped to set up a reference point for the reasons to actual occupant behavior, how perception, lifestyle, norms, rules lead to various actions at home (Figure 1). Secondly, through this study, a framework for the relationship between occupant behavior and energy consumption was created (Figure 2), based on the determinants of behavior, i.e. occupant characteristics (educational, economic, social), dwelling characteristics (envelope, systems, lighting and appliances…). This literature study set the context and also the first steps of this research. The determinants found through this review (Table 2) gave input to the content and structure of the questions of the survey designed for the OTB dataset. Chapter 3 is a sensitivity analysis conducted using the actual heating behavior data of occupants in the OTB sample. The aim was to model heating behavior and heating energy consumption using Markov chains and Monte Carlo methods. Secondly we wanted to evaluate the robustness of energy consumption of a dwelling to heating behaviors such as thermostat, radiator and ventilation control, as well as presence. The results of this Chapter were compared to Guerra Santin’s work (2010), which analyzes the same data using correlation and regression analyses. The research reported in this Chapter was a collaborative work between Harputlugil and Bedir. The data was collected by a questionnaire prepared by Guerra Santin and Bedir, using OTB’s means of data collection. Data organization and initial statistical analysis was done by Bedir, simulations were conducted by Harputlugil and Bedir together, and finally the evalutation of outputs were done by the same authors. The co-author (G. Harputlugil) has given permission to include this paper in this thesis. Following the sensitivity analysis on heating energy consumption in Chapter 3, Chapter 4 is an analysis on the determinants of electricity consumptions in Dutch dwellings. The OTB sample was used for analysis, and it was validated with analysis of the WoON sample. The work was published as: This Chapter deals with the Research Question II of this thesis: (Chapter 1, Section 3, pg. 16-17) “II. What is the influence of lighting and appliance use on the total electricity consumption in dwellings?" 2. How much of the variance in electricity consumption in dwellings can be explained by direct and indirect determinants?” The research reported in this Chapter was conducted by Bedir. The data was collected by a questionnaire prepared by Guerra Santin and Bedir, using OTB’s means of data collection. The analysis was done, and the paper was written by Bedir. The co-authors commented on the drafts and gave advise on the structure, and the content of the paper. The co-authors have given their permission to include the paper in the thesis. In the previous Chapter we made a sensitivity analysis based on actual energy consumption and heating behavior, on the whole OTB sample using methods like Markov chain and Monte Carlo analysis. In this Chapter (Chapter 5) a deeper analysis of heating behavioral patterns is reported. The study included 61 houses randomly chosen from the Netherlands, monitored for 2 months during March and April 2011. The thermostat use patterns of households were studied as well as chosen maximum and minimum set points each day for the whole sample. Then these patterns were correlated with the household and dwelling characteristics of the sample. Unfortunately, the collected energy consumption data for this sample was not reliable to be included in the analysis. This Chapter deals with the Research Question III-1 of this thesis: (Chapter 1, Section 3, pg. 16-17) “ III. What are the behavioral patterns and profiles of energy consumption? The research reported in this Chapter was conducted by Bedir, borrowing the dataset of Sonja van Dam. The data was collected through monitoring, by and for Sonja van Dam for her PhD research, using ENECO’s means of data collection. The analysis in this Chapter was done, and the paper was written by Bedir. The co-author has given permission to include this research in this thesis.